CORPUS CHRISTI, TX, May 3, 2018 /CNW/ - Uranium Energy Corp (NYSE American: UEC, the "Company" or "UEC") is pleased to announce that the Company has recently completed its previously announced Purchase Agreement (the "Agreement") with Uranerz Energy Corporation, a wholly owned subsidiary of Energy Fuels Inc. (collectively, "Energy Fuels"), and now holds 100% of its advanced stage North Reno Creek ISR project ("North Reno Creek" or the "Project") located immediately adjacent to and within UEC's existing Reno Creek Project permitting boundary in the Powder River Basin, Wyoming (see Figure 1 below; the "Acquisition"). The North Reno Creek leases and claims acquired through this Acquisition consolidate UEC's land and resource* position in the region. North Reno Creek adds further scale to an already large, fully permitted and construction-ready in-situ recovery ("ISR") project located in the United States. North Reno Creek is situated within UEC's existing permitting boundary at Reno Creek, allowing for integrated development. Amir Adnani, President & CEO, stated: "We are very pleased to complete this highly synergistic acquisition integrating North Reno into our broader Reno Creek project area. This further cements our position in controlling one of the largest, fully permitted and 100% un-hedged low-cost ISR portfolios in the United States. This acquisition also comes at a time when international trade and geopolitical developments underscore the importance of domestic uranium supplies in support of American energy security." 1,625,531 common shares of UEC (each, a "Share"), at a deemed issuance price of $1.5072 per Share, representing the volume weighted average price of UEC's common shares on the NYSE American for the five trading days immediately prior to (but not including) closing. Substantial historical exploration, development and project permitting have been performed on the North Reno Creek property. Beginning in the late 1960s and continuing into the mid-1980s, Rocky Mountain Energy ("RME"), a wholly owned subsidiary of the Union Pacific Railroad, drilled more than 800 exploration drill holes on the North Reno Creek property. In the late 1970s and early 1980s, RME successfully operated and restored and reclaimed a uranium ISR pilot plant. Subsequently, RME nearly completed permitting and licensing for a commercial scale ISR facility. In 1992, the Reno Creek Project was acquired by Energy Fuels Nuclear, Inc. ("EFN") from RME. Over the next decade EFN and its successor, International Uranium Corporation (now Denison Mines), continued to advance the project toward full permitting and licensing. Subsequently, Rio Algom and Power Resources held the project until dropping all of their interests in 2003. Between 2006 and 2008, Uranerz acquired mineral and surface land interests covering approximately 1,280 acres of fee mineral leases and federal mining claims comprising the North Reno Creek Project. In June 2015, Energy Fuels Inc. acquired Uranerz, whose development assets included the North Reno Creek property. 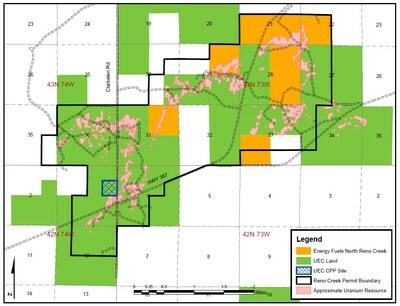 Upon the closing of the transaction the Company plans to engage a qualified person to complete the necessary work in order to update and incorporate the Uranerz North Reno Creek resource estimate into the Company's Reno Creek Project and complete an updated technical report under NI 43-101 (the "Updated Report"). Until such work is completed and the Updated Report completed and filed Uranerz's prior Technical Report resource must be considered historical in nature and cannot be relied upon and should not be construed to reflect a current resource estimate in accordance with NI 43-101.